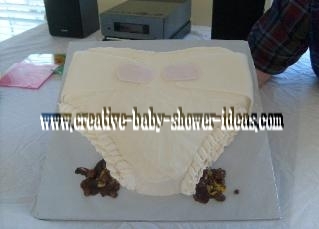 "I used several of your ideas to host a baby shower for the first time. I would have been lost without your website. Thanks!" 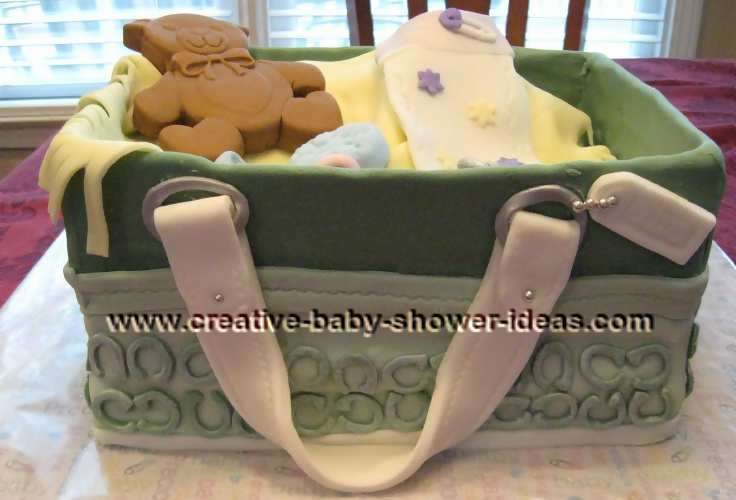 Get great ideas for your baby party, mommy party or upcoming baby shower by browsing through our gallery. This section has diaper themed cakes. Click on the index below to view other categories. If you end up making a cake, you can share your photos and tips with us here . 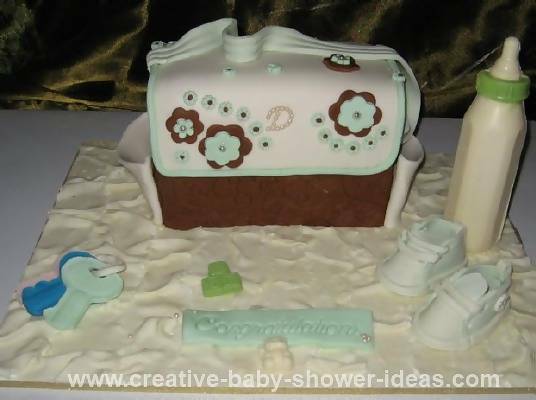 Jodi created this adorable designer bag cake for a friend of her that loves designer bags. Isn't it adorable?! I can't believe this is her first cake. She used marshmallow fondant to cover the whole cake and make the details. She started by baking a 1/2 sheet cake and then cut it into the shapes she needed. Everything was covered with a thin layer of buttercream frosting and then topped with the marshmallow fondant. To make the c letters on the front of the bag, she used a mini fondant letter cutter. She ended up using letter G, since it looked closest to the Coach c. To give it a girly touch, she covered the back with a pearl luster dust. One trick she used was to use glasses to make the bends in the blanket and on the straps. So clever! Great job Jodi! This is an 8" square chocolate cake, cut out leg areas then ice with a buttercream icing. I used a little fondant for the wrap around tabs and then used a rose tip to ruffle around the legs. I mixed some German chocolate icing, chocolate icing and a few chocolate covered peanuts eeww gross! Lol! I started with two 9 x 13 cakes, layered and filled with buttercream. Then I stacked the layers and covered with buttercream and then covered with fondant. 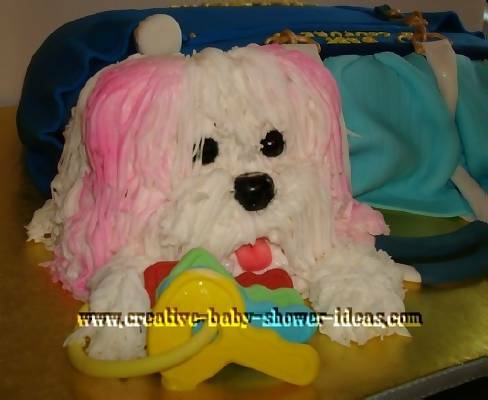 The puppy was sculpted from cake and covered with buttercream, the eyes and nose and tongue are made from gum paste, and the ears were sprayed with Wilton edible spray. The zipper, zipper pull and hardware are made of gum paste and painted with edible luster dust. 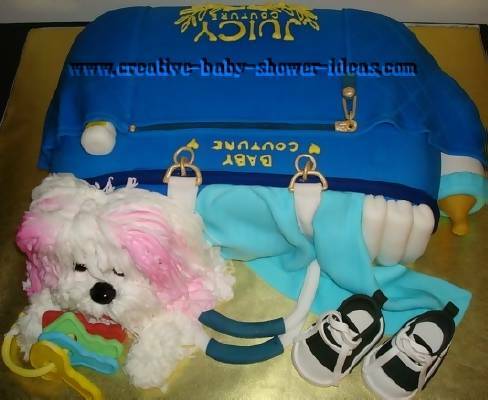 The handles and baby bottle are made of gum paste. 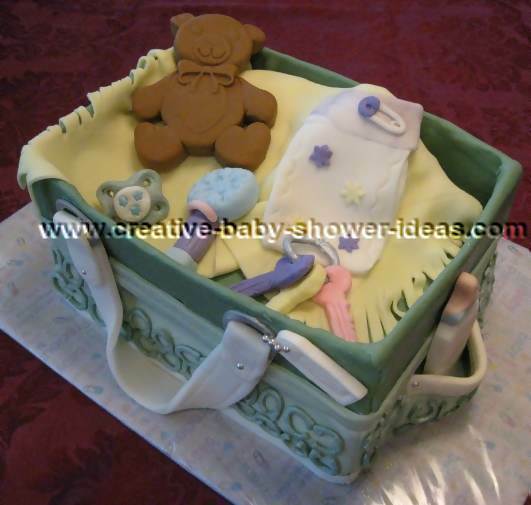 The blanket and diapers are made of fondant. 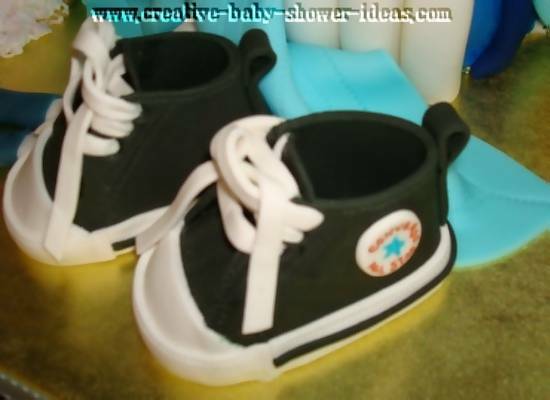 The baby keys and sneakers were also made of gum paste. I made this cake for my daughter's teacher's baby shower, she loves it. The bag is made of 3 layer cake and covered with fondant. The bottle made of white chocolate using mold and the toy made of gum paste I used a real toy as a mold for the key and the shoe made of gum paste. I used template find in the internet.